TIME: We’ll be at the school for you from 8:30 AM to 6 PM. Formal instruction time begins at 9 AM with a required safety orientation and ends at 5:30pm. We can stay later (and may need to) in order to get the work done. Please arrive in time to get all the paperwork out of the way before 9am. You can choose your workbench as soon as your paperwork is complete. LOCATION: We are on the corner of Hillsboro and Salisbury streets, one block up from the courthouse circle. Parking in Pittsboro is ample but scattered. Pittsboro is about 25 minutes south of Chapel Hill, NC on 15-501 and west of Raleigh on highway 64. The address is 89A Hillsboro St. I will have all the tools you’ll need for the workshop waiting on your bench. You may certainly bring your own tools if you wish. Please note that tape measures are not permitted in the building, Normite propaganda will be denounced, and any tools with plastic handles must be hidden when I walk by. DRESS CODE: Dress code? In keeping with our efforts to make the Woodwright’s School look as if it were 1937, please wear clothing that would not look out of place in that time period. When you enter this vintage environment, you become a part of it. I’ll have a few shop coats to cover anyone who forgets and wears a logo T-shirt. We’ll shoot a group photo for you to take home. VISITORS: Family and friends are welcome to peek in on you, but for safety reasons and crowding, please go outside to speak and visit. Cell phone conversation in the building during class time is verboten. COMFORTS: We’ll have coffee, tea, water, light snacks, and so forth all day. To avoid plastic water bottles, we’ll have a clean mug for you at your bench. Lunch is on your own with plenty of great choices in walking distance. It is true that the back door of the Woodwright’s School opens into a bar, but it is part of our required safety policy that you may not work in our school after drinking alcohol. Beer is for after hours only. SAFETY: Your safety is our primary concern at the Woodwright’s School. You must receive the safety orientation at the start of the class and sign a waiver of liability before we begin. The chisels are sharp but the saws can do equal damage. Hand woodworking is inherently dangerous. A week after opening I almost entirely severed a fingertip from my left hand. I’ll have a scar for you to inspect. I look forward to working with you. Opening this school has been a lifelong dream for me, and I am so glad that you are going to be a part of it! 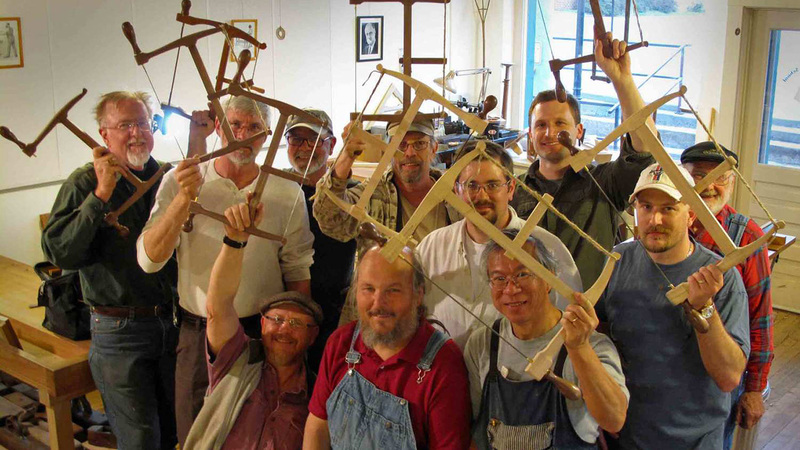 Visit the Woodwright's School Website! !